In this new two-species cookbook, Brandon Schultz has adapted dozens of unpretentious recipes for people food” to fit both the palate of humans and the dietary limitations of cats. He covers what foods are and aren’t safe for our furry companions, suggests resources for making day-to-day cat food, and gives tips on making food for special occasions appetizing for both human and cat. Each recipe has instructions and ingredient lists for both types of diners. 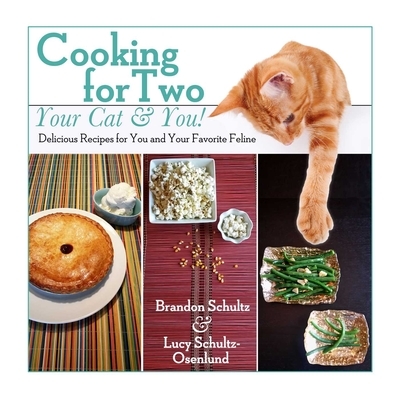 With Cooking for Two: Your Cat & You, you’ll be on your way to happy mealtimes for owner and kitty! Brandon Schultz is a lifelong cat lover who has lived with more cats than people and loves to cook. He is the author of The Taco Revolution, and his cat, Lucy, allows him to share her apartment in Brooklyn, New York, along with their dog, Chase. Lucy Schultz-Osenlund is a seasoned food taster and invaluable sous chef who prefers water glasses to bowls and loves the sound of can openers in use. She is particularly fond of ice cream and is notoriously vocal with her strong opinions. She is 5 1/2 years old and lives in Brooklyn, New York, with a human and a dog, who shall remain nameless.